Entangled Whale Under Shark Attack Rescued – Neptune 911! Editor’s Note: This whale disentanglement story is unique–an entangled humpback whale under an apparent attack by a great white shark. Scientists rescued a humpback whale entangled in ropes and bitten by a great white shark as the shark prowled the waters beneath them Saturday. 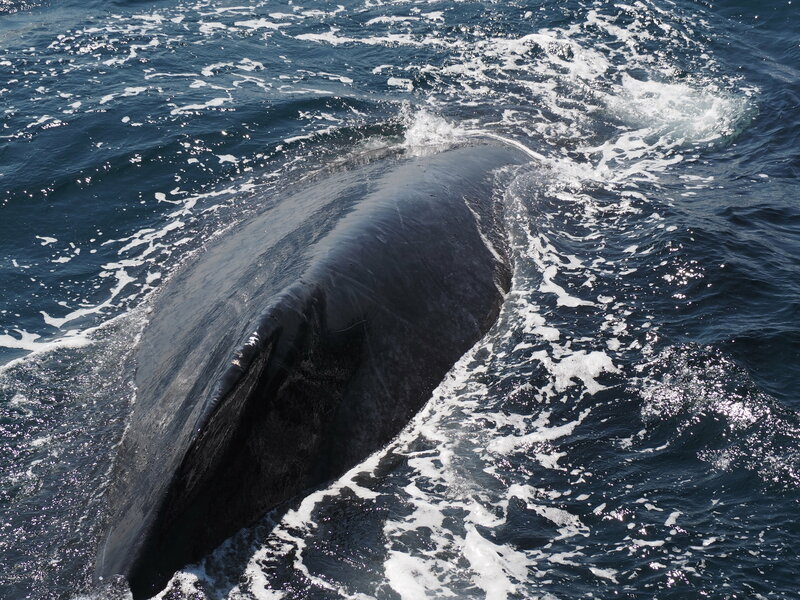 While conducting research on gases exhaled by humpback whales, Center for Coastal Studies researchers discovered a young whale on Stellwagen Bank, a popular feeding ground for whales about 5 miles north of Provincetown. The whale, hogtied from mouth to tail, was immobile at the surface of the water and had sustained a large bite wound on its left flank from the shark. Rope was found running through the whale’s baleen and wrapped around its flukes, leaving it especially vulnerable, since it couldn’t fully use its tail for swimming or defense, Cathrine Macort, executive assistant at CCS, said in a release. CCS researchers do not know how long the whale had been entangled, she said. When Dr. Robbins found the whale floating with its back at the surface, she initially thought the creature was merely resting. But as she got closer, she saw the rope, the shark, and the whale’s bloodied dorsal fin. “Because of the entanglement, the whale was unable to move normally, and was likely quite limited as to how it could thwart the shark,” she said in an e-mail. To ensure staff safety from the approximately 15-foot shark, the center’s Marine Animal Entanglement Response team began the disentanglement operation from aboard its 35-foot response vessel, Ibis, named after the first whale the organization freed in 1984. The team used a hook-shaped knife connected to a long pole to cut the rope from the mouth of the whale. That allowed the creature, which was curled in the shape of the letter “C,” to correct its posture.